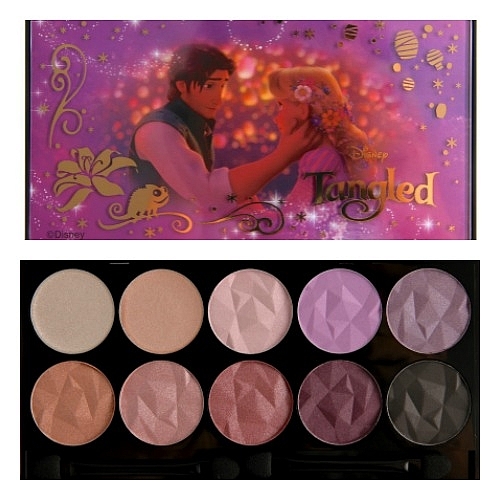 Considering the success of the first run, ITS’DEMO is once again releasing the very popular Disney Princess Eyeshadow Palette. And this time, Frozen joins the lineup. 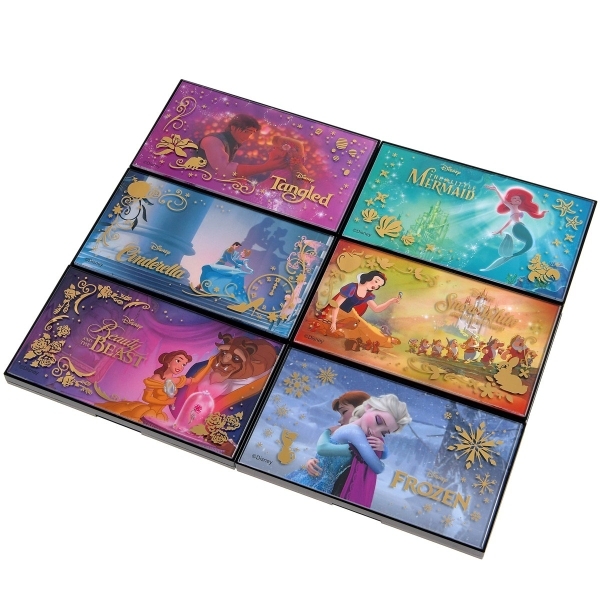 The Japanese makeup and accessories chain ITS’DEMO (which is a play on the Japanese word itsudemo meaning “anytime”) is bringing back the Princess eyeshadow palette series. This round’s lineup comes in six varieties: Rapunzel, Belle, Cinderella, Snow White, Ariel, and the new addition of Anna & Elsa. The front plate is beautifully decorated with gold emblems atop an equally gorgeous art piece of the princess(es). 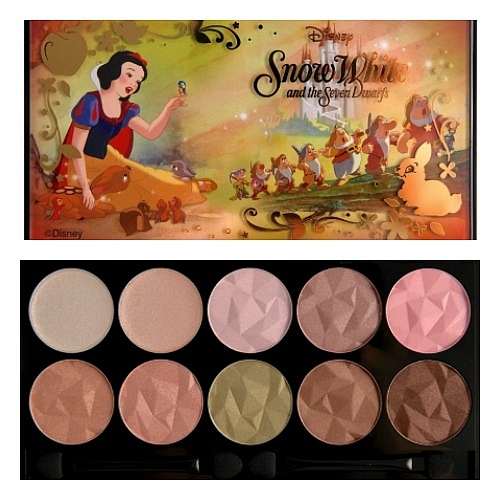 Each palette comes with 10 shades meant to resemble the color scheme of the featured princess. At a price of 1400 yen, it’s a great deal at about $1.25 USD per shade. Rapunzel’s front plate bears the famous lantern scene. The gold emblems feature her sassy chameleon sidekick, Pascal, alongside the magical flower with lanterns lining the edge. The purple shades on the top row reflect Rapunzel’s dress. The bottom row contains more golden tones which is inspired by her magical hair. Cinderella’s front plate shows the pumpkin carriage, the clock at midnight, and of course her misplaced glass slipper. The top row of the palette contains white, silver and blue meant to reflect the magically gifted blue ballroom gown. 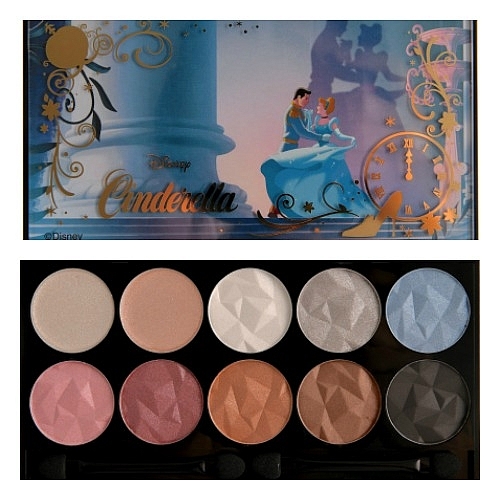 The bottom row is reminiscent of the hues of Cinderella’s household cleaning outfit given the brown tones. Similar to Rapunzel and Cinderella, Belle’s front plate features the princess with her respective partner. The gold emblems naturally take on roses. 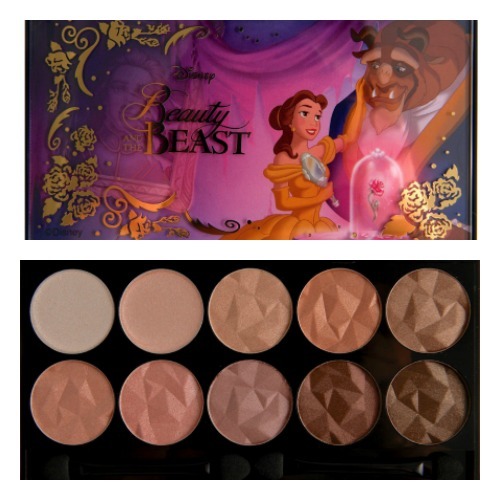 Belle’s palette is fully composed of golden and brown hues, no doubt a nod to both Belle’s ballroom attire and the Beast’s own color scheme. Ariel’s front plate features the mermaid against a backdrop of King Triton’s palace. The golden emblems show Sebastian as part of the border of seashells and starfish, a nod to the classic song “Under the Sea”. Ariel’s palette features marine-related tones and hues as captured in the silvers of the seafloor and the varying emerald greens of the ocean. Snow White’s front plate shows both the young princess and the 7 dwarves. The golden emblems are made up of the woodland creatures Snow White befriends throughout her journey. The palette contains more earthy colors compared to the others especially in varying shades of brown. The hues are meant to compliment the forest scene where the dwarves work and the animals play. 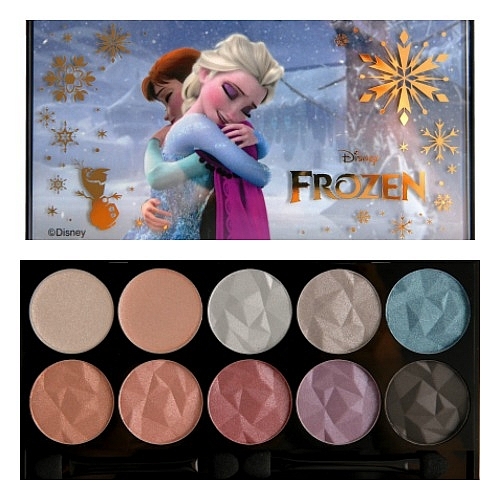 The newest addition to the eyeshadow lineup is Frozen which of course features Anna and Elsa. The gold emblems of the front plate show Olaf and snowflakes in varying sizes. 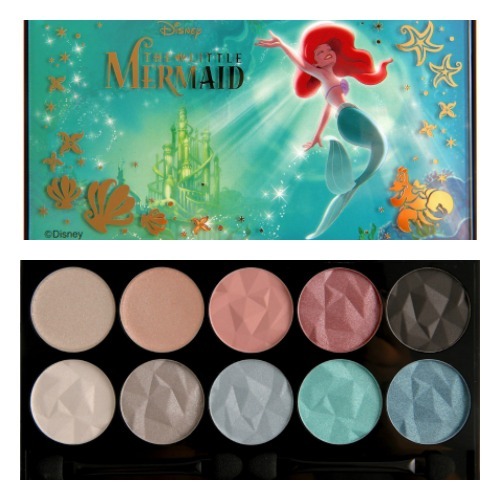 The top row and bottom row of the palette captures Elsa’s and Anna’s images respectively. Silver, grey and blue for Elsa; brown tones for Anna’s hair and the purple and black for her outfit. It’s clear to see that the given shades were carefully chosen to take after each Disney princess. What is incredible is that not only does it reflect her appearance, but also her attire, her love interest, and her world.